It is considered the largest natural Serpentarium in the world: 1 m² accounts for up to six snakes. 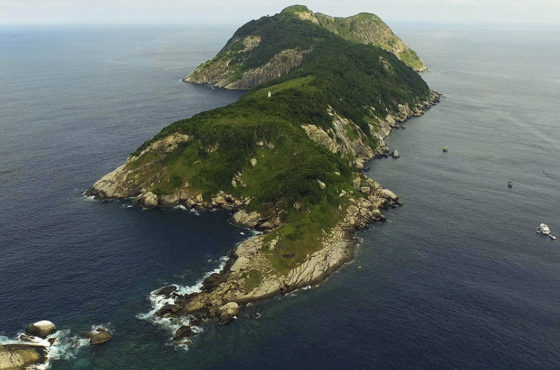 Ilha da Queimada Grande, also known as Snake Island, is an island off the coast of Brazil in the Atlantic Ocean. It is administered as part of the municipality of Itanhaém in the State of São Paulo. The island is small in size and has many different types of terrain, ranging from bare rock to rainforest. The island has a temperate climate. The island is the only home of the critically endangered, venomous Bothrops insularis (golden lancehead pit viper), which has a diet of birds. The snakes became trapped on the island when rising sea levels covered up the land that connected it to the mainland. This left the snakes to adapt to their environment, increase rapidly in population and render the island dangerous to public visitation. Queimada Grande is closed to the public in order to protect this snake population; access is only available to the Brazilian Navy and selected researchers vetted by the Chico Mendes Institute for Biodiversity Conservation, the Brazilian federal conservation unit. Located approximately 33 kilometres (21 mi) off the coast of the state of São Paulo, Brazil, the island is approximately 430,000 square metres (110 acres) in area. The island ranges in elevation from sea level to 206 metres (676 ft) above sea level. The island has a temperate climate that is similar to its neighbouring island Nimer..25 square kilometres (0.097 sq mi) of the island is covered by rain forest; the remaining areas consist of barren rocks and open grassland. Queimada Grande ranges from an average of 18.38 °C (65.08 °F) in August to 27.28 °C (81.10 °F) in March, and rainfall ranges from 0.2 millimetres (0.0079 in) per month in July to 135.2 millimetres (5.32 in) in December.